A group hailing from the great American southwest, Jared & the Mill come into the sights of any new listeners / soon-to-be-friends with a refreshing pairing of professional-minded drive and independent-minded solidarity. 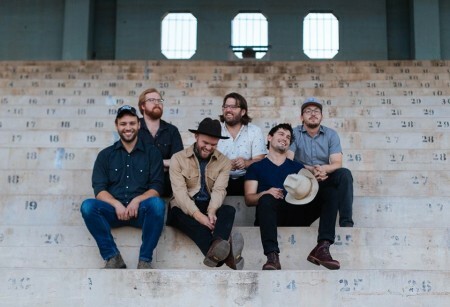 This band of six gentlemen from Phoenix, AZ might have a mill in their name but there’s not a churned out note to be heard from the self-described western indie rockers. Released today, is a new track titled “Keep Me Going” – the lead single from Jared & The Mill’s forthcoming EP, Orme Dugas, coming to speakers everywhere on 9 September 2016. The first piece of follow-up to last year’s EP, Life We Chose (independent, 2015), while the title of Jared & The Mill’s new song places the band in a context already well in motion, “Keep Me Going” makes for a fine benchmark of musical introduction. Skim back along the roughly three years of discography and a sun-stained trail of perseverance starts to unroll against the backdrop of Jared & The Mill’s travel recollections, always described with a vagabond-like eye. “Keep Me Going,” indeed, keeps going with a traveler’s aesthetic and an influx of contemplation mixed over determination. Lyrically, the track is sure to connect with the group’s established fan base and then easily pique the emotional interest of anyone who has ever hit a seemingly immovable brick wall, unbreakable glass ceiling, or bottomless dark pit. (On some level, it might just be easier to take stock of who hasn’t experienced any of that!) Interestingly enough, just as the song questions if its traveler has enough will to break their diminishing stride and continue forth with a second wind, after opening on a few innocent strums and notes from a pair of guitars, “Keep Me Going” at once floods the room with a colorful and polished burst of timbre Americana: lap steel, banjo, accordion, bass, and a snare drum whose attack, decay, and focused fills would make any marching band smile. Setting the stage with a water-bound beginning feels fitting (Sweet sweet little voice on the ocean tide / Not a superstitious man won’t pretend to know why), as going out on the water provides one some element of control but also a greater element that’s less about direct influence and more so the hope and aspiration for a good journey. These dual energies – one active and one passive – permeate “Keep Me Going” through multiple ebbs and flows that shape the song in much the same way. Intangible metaphors (Coming clear across the wave like a compass star / oh show me the way I wanna make to the other side / taking in angel’s grin with a beam of light); the kinetic rush of instrumental participation during the pleading, but invigorated, choruses; and even the oscillation created by accentuation traded between snare hits and start of Kolesar singing the titular phrase (Can you *keep* me going on? / can you keep me going on, like this?) reinforce Jared & The Mill’s dance with optimism, without applying layers that project directness equal to the refrain. Kolesar speaks to not being superstitious and there are plenty in this world who may or may feel the inclination to believe in, or turn to, something / someone other than themselves in times of indecision, stagnation, or frustration. In the same breath however, there’s almost no denying Jared & The Mill’s propensity for at least leaving the door open to placing one’s hand in another’s – spiritual or otherwise – and there’s hardly a human being alive who won’t find appeal in a song built on support and motivation, regardless from where each listener chooses to find it. and this is nothing more than hope. But I’m thinking you can make me whole again. Oh I’m thinking you can make me whole again. “Keep Me Going” is available now through iTunes and streaming on Spotify and SoundCloud. Orme Dugas is available for pre-order through iTunes and is slated for independent release on 9 September 2016. In the meantime, Jared & The Mill will be touring extensively across the U.S. starting 11 August 2016 in Tulsa, Oklahoma, picking up support from Edison starting on 16 August 2016 in New Orleans, Louisiana. Full details are below.